I love good Mediterranean and Middle Eastern food. Lucky for me (and the animals), much of this cuisine is vegan or can easily be made vegan. 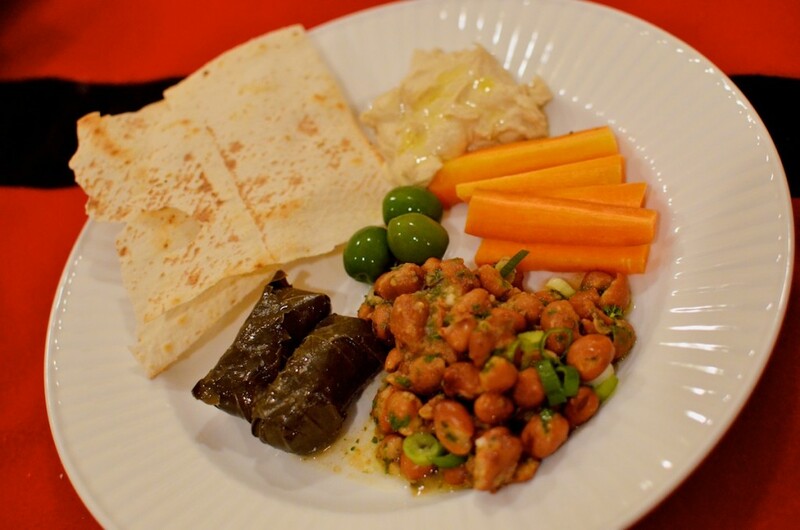 I stumbled upon a dish called foule mudammas or ful medames (there are a variety of spellings) when I was eating at my local favorite Mediterranean restaurant, Sahara. I order it every time. I also have learned that this dish is a staple breakfast food in places such as Ethiopia, Sudan, Egypt, and Syria to name a few. When I was recently shopping to buy some tahini for a hummus dish, I stumbled upon these cans of fava beans in the Middle Eastern section of Wegmans. I knew right away they had to be mine. Oh, yes, they had to be mine! I scooped up 4 cans and kept them in my cabinet for a special occasion. Today was that occasion. I learned from a One Green Planet posting that today was National Bean Day! 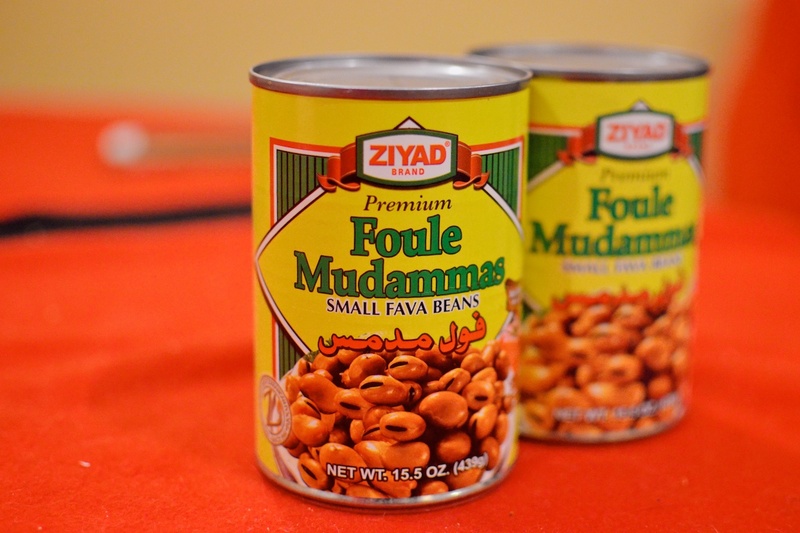 As a lover of beans and having a hankering for some foule mudammas, I knew I had to make them. I had all of the necessary ingredients on hand to boot and this dish came together quickly. I used the back of the can’s recipe as my template and changed the proportions to suit my tastes. Here is what I came up with. Cook the fava beans in their own liquid on the stovetop until they are warmed throughout. Drain the beans and transfer them to a large bowl. Slightly mash the beans with a spoon being careful to retain most of their shape. Add the parsley, lemon juice, garlic, salt, and olive oil. Mix gently. Garnish with the scallion and more parsley and olive oil if you choose. Serve immediately with warm flat bread or pita. I rounded out my meal with raw carrots, hummus, dolmas, olives, and warm flatbread. It was amazing! 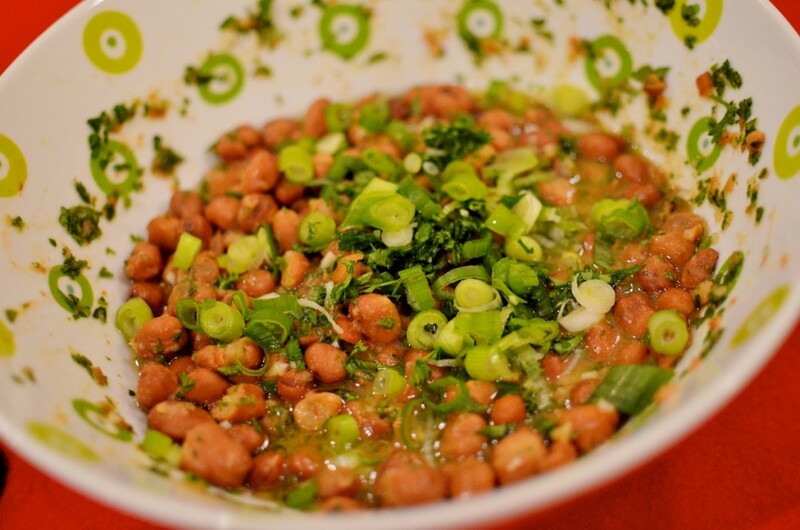 The fresh flavors of the lemon, garlic, and parsley went well with the protein-packed fava beans. Now, someone pass the Chianti! Mr. Tuxedo Cat generously rated the foule mudammas a strong 4 1/2 out of 5 carrots on the veganlicious scale! We traveled to Hawaii this summer because I was presenting at a conference for work. 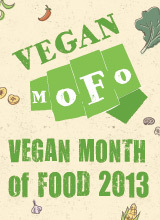 I have heard great things about the vegan options there and was happy to explore the islands to find vegan food. I was extremely pleased with a vegan loco moco that I had at the Downbeat Diner in Honolulu. Loco moco is a traditional Hawaiian meal, usually made up of white rice, a meat patty, brown gravy, and eggs. There are many variations of this, but it was a real treat to have a vegan version. 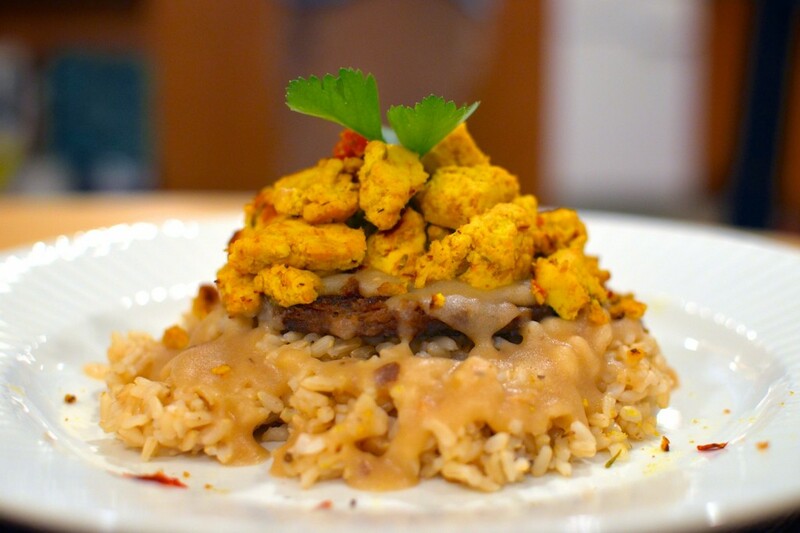 Here’s an amazing video for vegan loco moco from veggietorials using The Vegg. I didn’t have the time, nor the ingredients for the spherification process, so I kept it simple. When I took the first few bites of this dessert at the Natural Kitchen Cooking School, I wasn’t impressed. I’m used to much sweeter desserts and typically don’t consider something a dessert if it doesn’t have chocolate infused somewhere. The more I ate though, the more I started to enjoy this different take on polenta. Usually I enjoy my polenta (aka “grits”) savory and usually as a breakfast item. 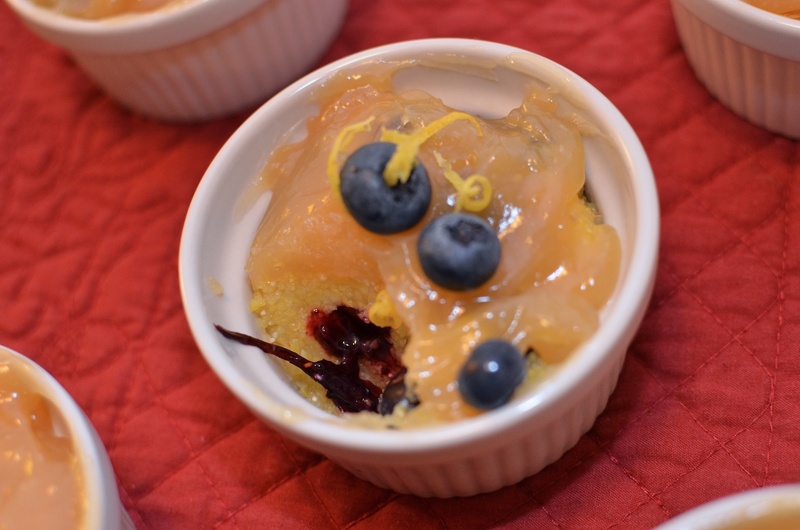 This cornmeal was sweetened with apple juice and included blueberries and a brown rice syrup-based glaze. It was a complex mouth feel and would be enjoyed by those who do not prefer very sweet dishes. I thought this would also serve well as a breakfast or brunch item. Amazing! When we made these in class, we served them in a large 9 inch tart pan. 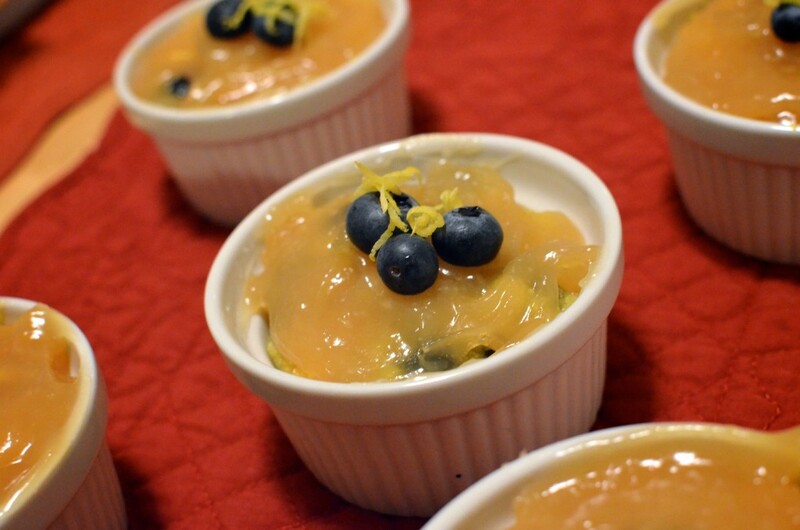 For my own home creation, I decided to use small ramekins and was pleased with the single serving amount. These would be adorable to serve to guests. Overall, I’d rate this dish as 3 1/2 out of 5 carrots on the veganlicious scale! I’ve had Ani’s Raw Food Desserts cookbook by Ani Phyo for awhile now and have made a handful of recipes from it. It was a pleasant surprise to see this book in our goodie bag for our April classes at the Natural Kitchen Cooking School. Armed with the task of picking one recipe from the book to make for homework was a challenge as there are so many delicious, fruity, raw desserts to choose from. I ultimately picked the Spiced Blueberry Cobbler (see Ani make it herself here!) based on the attractive picture in the book and because I had most of the ingredients to start (sans blueberries). This was quite simple to make, but I think I overdid the processing of the almonds and dates as my version did not look as chunky and loose as the cobbler pieces in the book. If I made it again, I would be more careful regarding that detail. I would also use whole almonds that still had the skin perhaps, as my slivered almonds may have been too small. 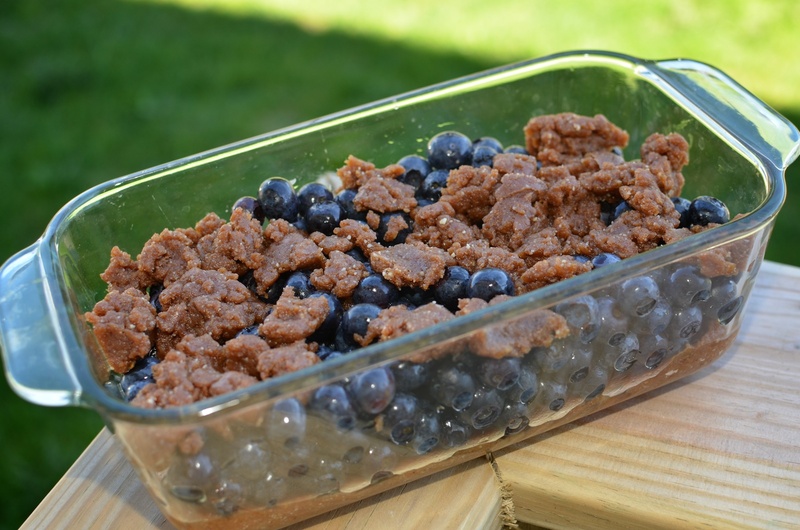 This dish makes for a nice dessert or quick breakfast. Overall, we’d rate this dish as 3 out of 5 carrots on the veganlicious scale! Growing up, some of my favorite dinners were breakfast dinners! Something about having what we traditionally ate in the morning always seemed even more exciting as the supper menu. I recently watched a program on television about the history of eggs benedict and how they were developed at a famous Manhatten restaurant many years ago. I thought it would be fun to veganize the dish, especially since I never had the original animal-based version. 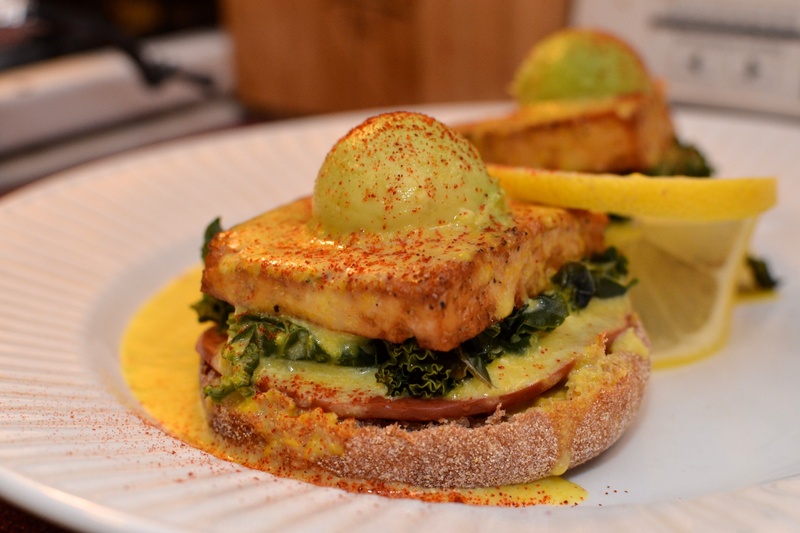 For our Easter dinner, I decided tofu benedict would make a smashingly good meal! I was inspired by Being Vegan and Getting Away It‘s blog post Benny and Flo Do Brunch, which outlines a fantastic recipe for this classic dish. I made the tofu using the same ingredients that she did, with just a slight change on the proportions of tamari and rice vinegar. 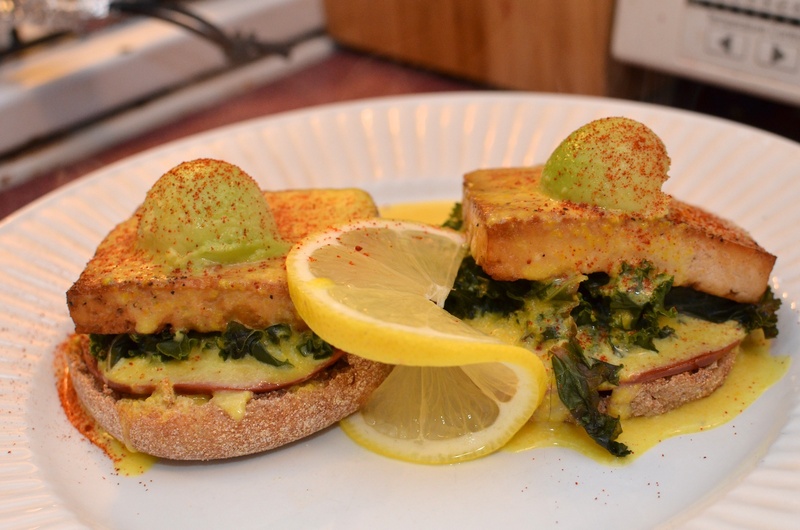 For the vegan hollandaise sauce, I reworked the recipe around my use of The Vegg. If you miss the taste of egg yolks and want to incorporate it into your meals, this is the first non-animal version to date that really tastes like it. I have at least one vegan friend who finds it so similar to chicken egg yolks, that she doesn’t like it. Highly recommend! It’s great for toast dipping! Heat blended Vegg in a small saucepan on the stovetop. Add milk and mayo and whisk. Add lemon juice, cayenne, turmeric, and white pepper and whisk. Let heat for approximately 10 minutes or longer, making sure to whisk or stir frequently. Keep warm up until ready for serving. 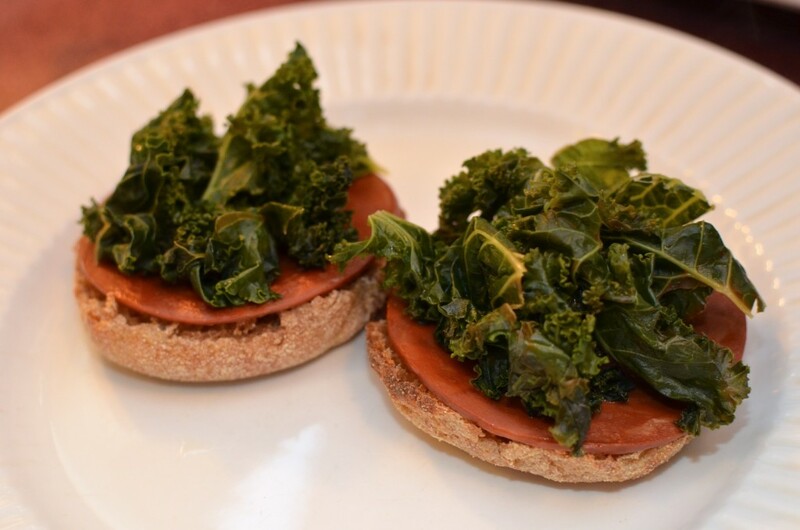 Instead of using spinach that was used in the Benny and Flo Do Brunch recipe, I substituted kale. I cooked one bunch of kale with a small amount of water until it was wilted in a large pan on the stovetop. I added 1 TB of ume plum vinegar and a pinch of cayenne at the end before serving it. Delish! For the veggie meat, I used Yves Canadian Bacon. This is a must have to really provide that salty, umami flavor profile. It’s been a staple item in my Vegan McMuffins too. They cook up in a flash on a skillet with a little spray of olive oil. Be careful not to overcook though, as they don’t require much heating. 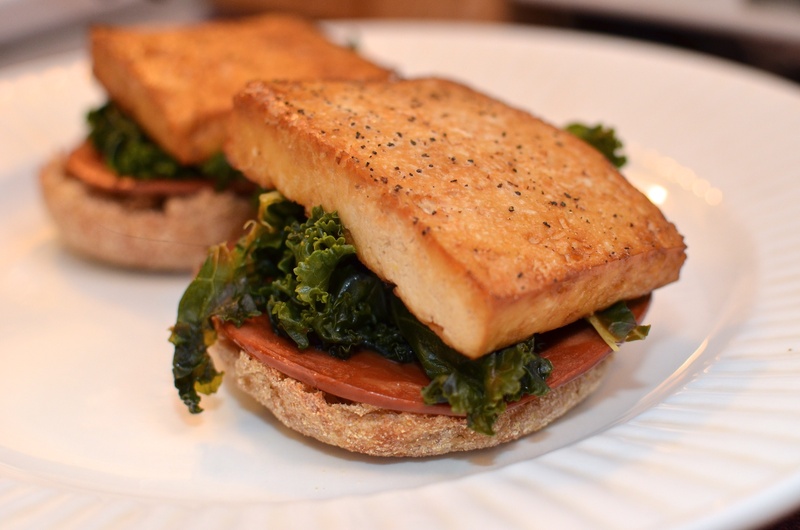 I served the layers on toasted whole wheat English muffins. While some may slather some vegan margarine on these, it really isn’t necessary. The combination of ingredients is so complex and tasty, you won’t miss the extra calories! I decided to top the bennies with scoops of avocado after being inspired by a tofu benedict brunch dish I had once at Milah Vegetarian in Philadelphia. It really gave it another layer of flavor and healthy fat to sink one’s teeth into. I garnished the plate with a lemon slice and a dusting of paprika! This is one dish you’ll want to have again and again. In addition to dinner, it would make an impressive brunch item for friends and family. Enjoy! Grab a fork and knife and eat up! Overall, we’d rate this dish 4 out of 5 carrots on the veganlicious scale!